Gillian Lee Smith: Half a tag! Well it is 11.30 pm here in the smith/cox household and I am only just getting round to writing my blog! Poor Mark has been off ill the last couple of days and I have been letting him have 'first dibs' on the internet to play his addiction while I try and work in the spare room in between hobbling about. Actually I am acting like a complete hermit at the moment. Yesterday morning I had a very strange experience as I was waking up. I actually woke up in mid sentence/dream where I was talking out loud to my dad (in the dream) about Macaulay Culkin (spelling?) who was on the TV and I was telling my dad that I think he has been singing and playing the piano since he was 17 and he is 22 now and releasing an album.' I woke up precisely as I was saying "he is 22 now" and I was talking really loudly and clearly! I woke up to find Mark staring at me with a wide eyed look as if I had completely lost all remnants of my sanity - seriously...he looked scared!!! And I can't really blame him! It was a very bizarre and hilarious moment! So I have been tagged by the beautiful Jenn where I have to list 10 unknown or seemingly random bits of information about myself. This is not so hard (although I am going to do it over 2 days as it is so late today), the hard part will be tagging 10 other people! 1. I frown....all the time...without realising it. I apparently have a permanent worried/lost in thought look on my face always and forever. It is in all my childhood photos and is evident by my forehead and in-between eye creases that have developed over the years etched into my skin. My friends have commented on it regularly, but it is not necessarily reflective of my mood at any particular time. I can be happy, sad, in turmoil, planning some (mis) adventure...all with this expression. 3. I still want to be many things in my lifetime. A doll-maker, artist, traveller, children's book writer and illustrator, puppet designer, a grandmother (although I have no great urge to be a mother at the present time) and of course costume designer. But most of all I want to be content with what I have at any one time but with the desire to still move forward. 4. 98% of the time I manage to resist reading my horoscope as I think I believe it is rubbish. However there is always the 2% where I just have to, to see if I am going to win the lottery (which I don't do) or bump into an old friend who I have not met in years (which is unlikely as I am living in city a few hundred miles away from where I have lived all my life). 5. My hair is it's natural colour at the moment, (reddish blonde - auburn I think?) which it has not been for about the last 12 years. I am secretly intrigued by how grey I am going and too lazy (or too poor) to actually do anything about it. And I am not sure if I see the grey as a bad thing. It could be classy....right? Okay....more to come tomorrow where I will write my next 5 things about me. So I have been quite busy making and listing on the etsy front the last couple of days which has been great. I have been signed off work (weird considering I am self employed) for a few weeks due to my back leaving me unable to drive or get to my workshops at all at the moment. I unfortunately can't even stand up straight or walk any distance at all which makes doing any kind of costume work or teaching impossible. It has been a hard decision to make but one that had to be made. I am hoping to get back as soon as possible though. So in the meantime, etsy is it. I am officially an etsy hermit for now and am trying to remain positive about it. I just wish I had more confidence in my work!! But maybe that will come. Here are 2 things I listed today. 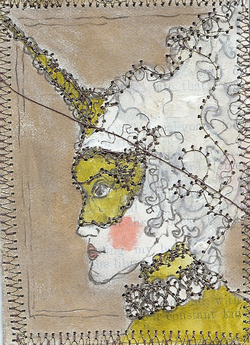 The first is a Masquerade ACEO. I am hoping to make more to add to this tomorrow so that there is a set. The second is called These Treasures of Mine (excuse the small image here - if you want to see a better size then you can click on it for a larger view). It is probably more like the work I created whilst at art college and I actually quite like it even though it is probably quite dark compared to the recent things I have been making. I have always loved dolls and marionettes and of course I adore drawing costume ideas, although I am not much good at getting the details down. I have a complete fascination with back braces and prosthetic limbs and have used them in abundance in past work and feel a desire to make the most of these shapes and bodily structures and straps and buckles in my work again. 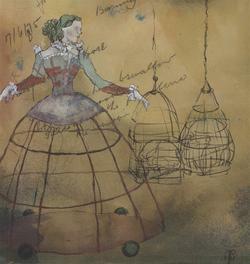 And of course there are the wonderful things that are bird cages. I love them. 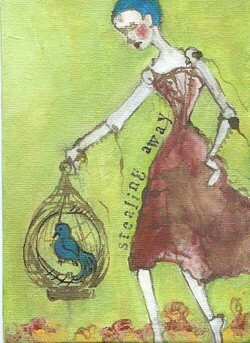 Oh and I wasn't going to put this in my blog but I also listed this small painting today. Stealing Away Leaving Footprints of Roses is another picture which is the beginnings of an idea I have had in my head for a while for a children's story. One I will probably never have the confidence to attempt to write, but I can dream of it by playing with these small art pieces nonetheless. It is also my (late) submission to last weeks creative challenge #44 where we were to use the colour lime plus at least one other from the spring/summer colour chart. I guess one of the things I worry about most in my artwork is that I am so inconsistent. I am not sure that I have yet managed to develop a definite style which is something I really admire in strong artists. I know I have a never-ending road to travel in terms of developing my art and I am only just at the very beginning. I am really just playing at the moment. Trying to enjoy it and not take it too seriously. I am inspired by so many different things and want to do so much. If it were to be a life-long thing, I am definitely just taking baby's first steps. But I guess that is no bad thing. Wow this has turned into a bit of an epic post!! My gosh if you are still here then I do admire you! So tomorrow comes the rest of my 10 things and also the names of people I will tag. 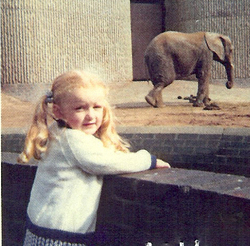 Maybe I will even have to hunt for another frowning childhood photo. Oh and don't forget about the UK etsy sale where all the participating sellers are listed here. All the above pieces can be found in my etsy shop and I am offering free shipping and a free gift for orders over $40 (orders totalling $40 after shipping has been deducted). That's pretty good 98% resisting reading your horoscope. I condsider that success. I too have not dyed my hair in a very long time, I have the greys to prove it! also I always frown too, which is why I have a severe crease on my forehead, I am not always sad, just a very serious girl, even when I was small. I love all your new work it is taking all my will power to keep from buying the new masquerade piece!!! I love you, feel better. Oh yet more tempting things for me to buy! How could I resist??? Coulnd't get the coupon to work, oh well, will just have to buy something else soon! Love your first 5 - grandmother but not mother - hmmm, wonder if thats even possible? And I DO think you have a personal style going! I can't put it into words, but I LOVE it! I adore your marrionette drawings!! I, too, feel that my work is inconsistent and I worry all the time that it is not professional enough. I hope to find the middle of the road & take myself and my "art" more lightly!